These numbers show how vital it is to have effective in-store displays for your business! Here’s how we suggest using your displays in your store. Large format displays are no place to be generic! This valuable marketing real estate should convey your branding and lure in your target audience–especially if you’re sharing that space with your competitors, such as a supermarket or mall. In this example, Dove has chosen Valentine’s colors and shapes to draw attention at the point of sale. And it’s not just because the display itself is tall! There’s more to a POP display than that. Everything here is heart-shaped or wrapped up like a fancy gift. Plus, it’s pink, red, or gold–colors of romance and luxury. 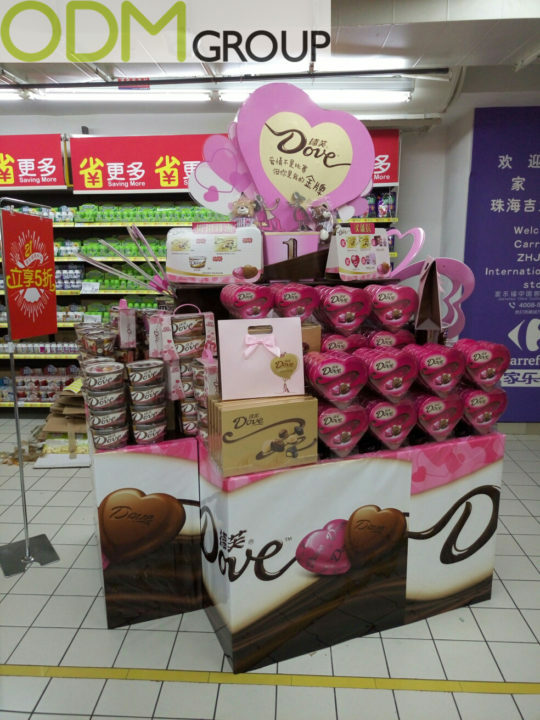 This may remind their target audience at checkout that they need to buy chocolate for their special someone–or just for themselves. Even the best signage will do you no good if it can’t catch your customers’ eye. Make sure you situate your large format displays and signage where people will see them, both to draw them into the store and to hang onto their attention at checkout. POP displays should be near your checkout lines and counter. If you’re using a display of products that is small but attention-getting–like the candy and magazine stands in grocery stores–then use it directly in the line. 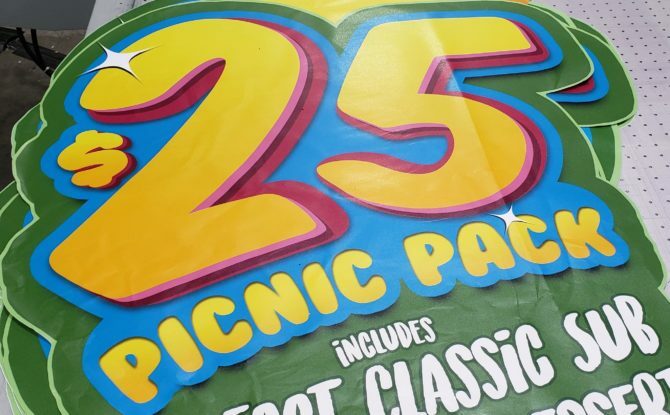 If your products or display are too large, it should be at the start of the line, where people can still see it as they pass and make that impulse purchase. You have only a few seconds to get customers’ attention at the point of sale! Even when your customers are waiting in long lines during the holidays, attention spans might be short, or divided between multiple distractions. Rather than using a lot of information like a menu of options during checkout, make the choice easy with a single offer with only as much information as you actually need to entice them. Then, make sure that you give clear, unique offers at the point of purchase. Don’t stick to generic messages or reinforcing your brand! Your customer is in your store already; they know who you are. This is the moment to capitalize on impulse purchases or getting a customer to join a mailing list. Even if you can put your products right behind the glass, it won’t stand out without signage! Are your products on sale? Are they new–and more importantly–are they necessary? At the same time, some signage displays–like for clothing–fall flat without the product to go with them. How can someone see how the fabric drapes in real life without that display? Products and displays are stronger together. Use careful color branding and designs to draw attention to your store and to the products within. 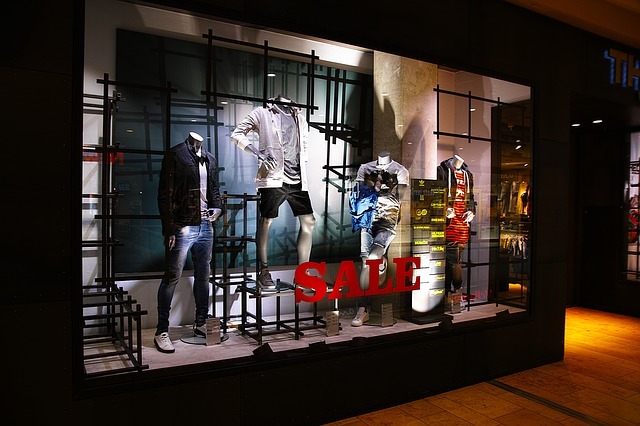 Excellent window dressing design along with the actual appeal of what you’re selling can help draw someone into your store for a closer look. Related: What Can You Do with Signage by Divvy? Everyone runs large format displays and big sales during the holidays. While they’re certainly still effective this time of year, few designs will stand out among all the other stores. Try out big, attention-grabbing displays during the rest of the year, too! Want the most effective in-store signage for your business? Contact Divvy today to create the most effective signs for your franchise.